A.I.M. 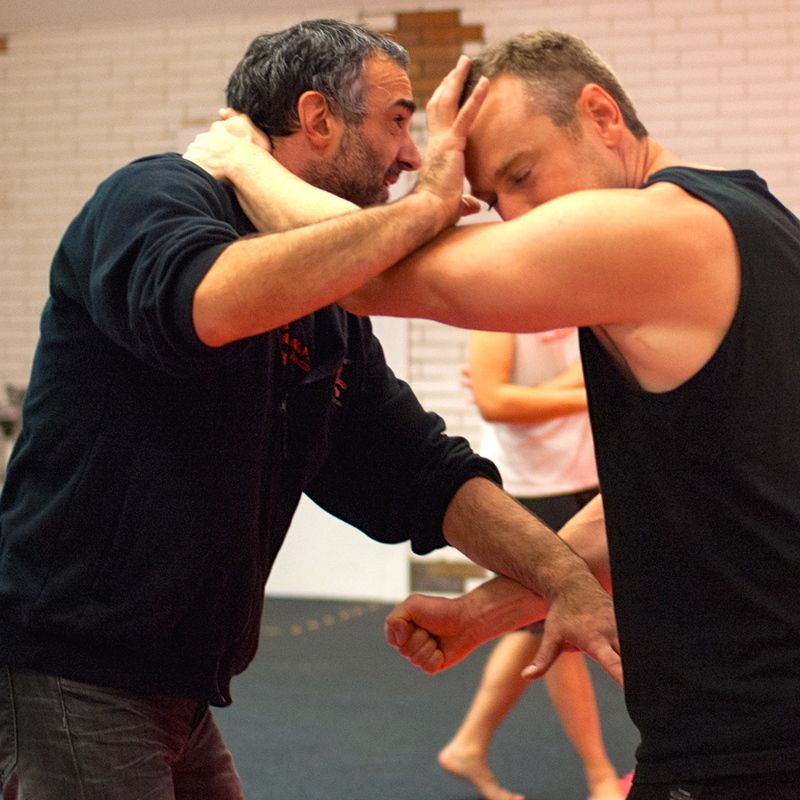 Academy Instructors, Robert Halaijian, Kacey Chong, Daniel Whyte, Cam Sobey, taught a Corporate Self-Defence Workshop for Mission Australia at A.I.M. Academy on Friday 30 October 2015. Mission Australia is one of the largest not-for-profit organisations in Australia and provides excellent programs for homelessness, social housing, youth, women, families, alcohol & drug dependencies, employment, skills & training, and mental wellbeing & disability support. This group of social workers & youth workers were introduced to principles & tactics from the S.P.E.A.R. System™ (founded by Tony Blauer) and Lawler Tactical (founded by Deane Lawler). A huge THANK YOU to Nick Mac Hale from Mission Australia for organising this Workshop! Fantastic to see Mission Australia taking pro-active steps to improve social worker safety, prioritising the personal safety of their staff, and putting resources into making everyone safer! What an awesome group to work with, and great feedback from the participants! “Excellent! Very informative and also fun! Do it!” – Shannon S.
“The trainers were cool, clear & concise. The training methodology was very effective – learning about the most vulnerable positions and then building on that. Excellent workshop! 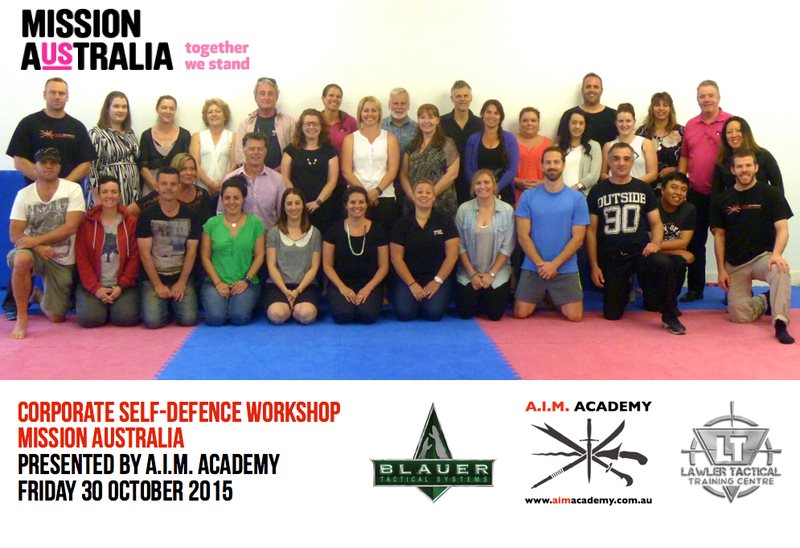 I would like to introduce this and yourselves to my workplace!” – Frankie G.
“The most important thing I learnt at this Self-Defence Workshop was how to create a safe barrier. I’m interested in further Self-Defence training for myself and my teenage children!” – Delicia M.
“Excellent humans!” – Tracey C.
“My main safety concerns are home visits and transporting clients. 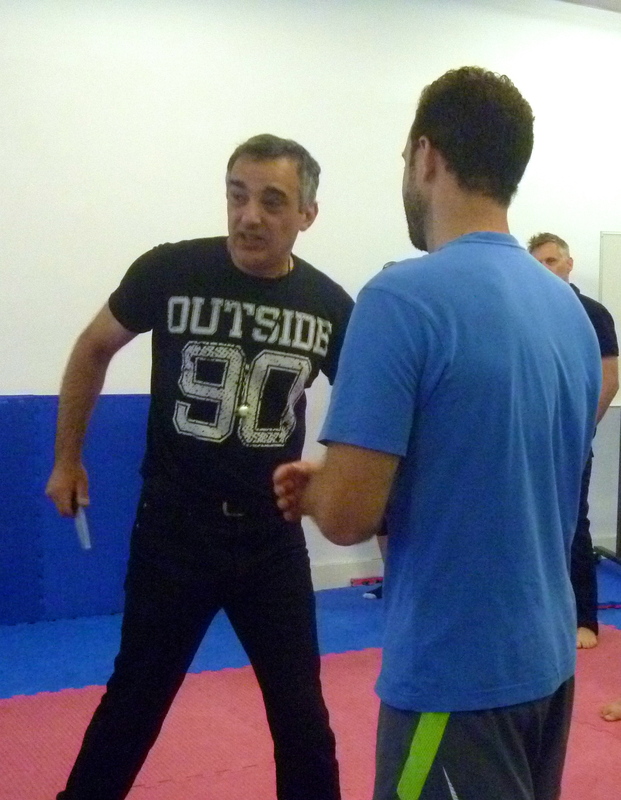 I really enjoyed the staff interaction at this Self-Defence Workshop and strongly recommend it to my friends & colleagues. 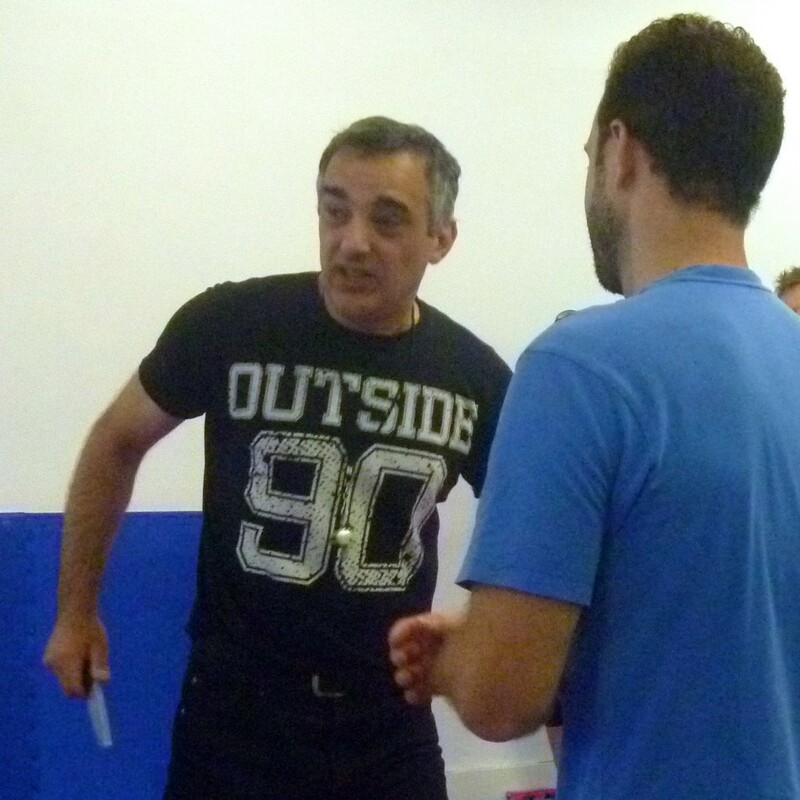 It was enjoyable, practical, and confidence-building!” – Rob S.
“My favourite part of this Self-Defence Workshop was the defence from weapons. It’s a must-try experience! What a great day! Great trainers! Full of useful training & knowledge!” – Ashley R.
“Anyone can protect themselves!” – Paul W.
“Super fun as a team-building exercise for work!” – Nicole C.
A.I.M. 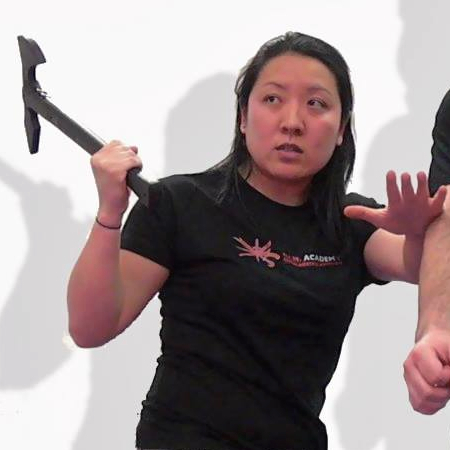 Academy Senior Instructor, Kacey Chong, covering planning for violence prevention. A.I.M. Academy Instructors, Robert Halaijian and Kacey Chong, discussing de-escalation and dis-engagement strategies. A.I.M. 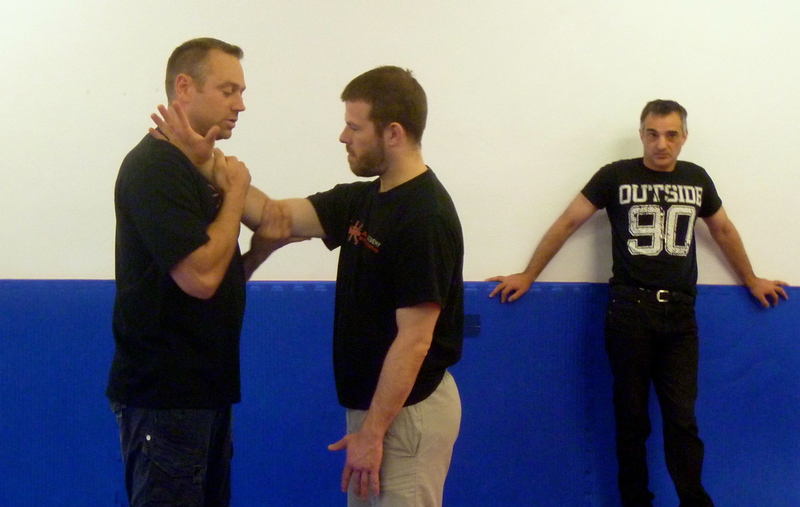 Academy Head Instructor, Robert Halaijian, demonstrating defensive tactics, distancing and target acquisition. A.I.M. Academy Head Instructor, Robert Halaijian, discussing strategies for defence against weapons. Mission Australia is a community service organisation that has been helping people to regain their independence for over 155 years. They offer a wide range of integrated solutions over the long term, through homelessness initiatives and affordable housing, early learning and youth services, family support, and employment and skills development. Their nationwide team of over 3,500 staff offer integrated services that work together to reduce homelessness and strengthen communities across Australia, by helping people secure jobs, receive an education, find housing and develop important life skills.